May 2018 -- Olivia Heuiyoung Park (ME'20) wins STEM grant for women. December 2016 -- Prof. Keene and four undergraduate students, Jessica Marshall (EE'17), Emily Adamo (A'17), Stephanie Restrepo (AR'17), and Monica Abdallah (ChE'17), exhibit the brewing elements, equipment, and beer from their independent study course, "The Science and Art of Brewing"
September 2016 -- Prof. Raja and Eliyahu Friedman (EE'16) co-author IEEE ITSC 2016 Paper titled "A Multiagent Solution to Overcome Selfish Routing in Transportation Networks"
September 2016 -- Prof. Yecko receives NSF grant: "Three-Dimensional Multiphysics Simulation of Multi-phase Flows with Magnetic Fluids"
August 2016 -- Max Howald (EE'16) co-author award-winning IEEE Paper titled "Verfiable ASICs"
May 2016 -- Prof. Mintchev gives talk on "Robust traveling waves in chains of simple neural oscillators" at the Biology and Medicine through Mathematics (BAMM 2016) conference at Virginia Commonwealth University. May 2016 -- Prof. Raja presents paper titled "Modeling Uncertainty and Its Implications in Complex Interdependent Networks" at the 13th Annual Acquisition Research Symposium, Monterery CA. May 2016 -- Robot Sumo Event, the mechantronics' final project exhibition, featured in Scientific American, Vice and Ars Technica for student innovation and design skills. May 2016 -- EE Seniors Eugene Sokolov, Harrison Zhao and Sheryan Resutov win 10K in "Dream It. Code It. Win it." for Wi-less Gauss, a glove that allows a user to perform the same functionality as a computer mouse using hand gestures. April 2016 -- Cooper Union's American Society of Civil Engineers (ASCE) student chapter selected to receive a letter of Honorable Mention for its outstanding activities as recorded in the 2015 Chapter annual report. April 2016 -- Civil Engineering student team wins 2016 Regional Steel Bridge Competition qualifying for the 2016 National competition, to be held May 27-28 in Brigham Young University. April 2016 – Prof. Dell appears in documentary: This House Matters by Tina Traster, which focuses on the successes and failures of an attempt to preserve and restore four historic houses, and its panel discussion. April 2016 -- Bushwick Daily article "Bushwick's Own Candy Chemist Eugene J. is Cooking Up Something Sweet" introduces alumnus Eugene J. (ChE '05) and his candy store, Eugene J. Candy Co., in which he is trying to incorporate his chemist skills into cooking/baking. April 2016 -- Alumni Justin Weinberg (ChE '12) and Igor Belyayev (ME '12) are in the process of developing an interactive mobile software called 101, aimed for college math and science students. This is following their success with a previous mobile app called Chem Pro, developed in 2010 for chemistry students. April 2016 -- Paper titled "Wave generation in unindirectional chains of idealized neural oscillators" co-authored by Prof Mintchev and B. Fernandez published in The Journal of Mathematical Neuroscience, vol 6:5. March 2016 -- The Department of Mathematics continues tradition of preparing engineering students for graduate studies at top-tier institutions. Over the last four years, Cooper Union alumni Veronika Shalotenko (UVA), Ryan Ronan (CUNY Graduate Center), Michael Kumaresan (CUNY Graduate Center), and Marcus Michelen (University of Pennsylvania) have commenced Ph.D. degree programs, with the goal of pursuing careers in research. This year, they will be joined by Tensae Andargachew (NJIT) and Peter Morfe (University of Chicago); both students will be pursuing graduate studies in mathematics. March 2016 -- Prof. Yecko co-authors paper titled "VOFI - A library to initialize the volume fraction scalar field" in Computer Physics Communications, Vol. 200, 291-299. March 2016 -- ASME Newsletter article "Graduating Female Engineer Looks to a Future in the Racecar Field" features ME Senior Amy Chambers and her new job as a design and validation engineer at General Motors. February 2016 -- Prof. Baglione and graduate student Michael Pimpinella (ME'16) are co-authors on a journal publication titled “The Use of Sound Level Meter Apps in the Clinical Setting” in the American Journal of Speech-Language Pathology, Vol. 25, 14-28. February 2016 -- Prof. Delgrammatikas (Mechanical Engineering) talks about "Breaking Barriers for New York City High School Students" as part of Cooper to Cooper: Conversations Across Disciplines. January 2016 -- Prof. Delgrammatikas hosts STEM days during winter break. December 2015 -- Paper titled "Establishing Cooperation in Highly-Connected Networks Using Altruistic Agents" co-authored by Prof. Raja presented at the IEEE/WIC/ACM Intelligent Agent Technology Conference 2015, December 6-9, 2015, Singapore. November 2015 -- Prof. Baglione served as invited panelist on The Built Environment at the 3rd Annual Sustainable Energy and Design Conference, Bronx Community College. November 2015 -- Paper titled "Visualization of pulsatile flow for magnetic nanoparticle based therapies" co-authored by Andrew Wentzel (ME'16) and Prof. Yecko presented at American Physical Society Division of Fluid Dynamics 68th Annual Meeting, Boston MA. November 2015 -- Prof. Dell gives an invited talk on "Geothermal micro climate at Keilir" at Keilir Atlantic Center of Excellence, Iceland. October 2015 -- Prof. Cumberbatch presents "The Social Meaning of Light" at the Waste Not Lecture Series, Parsons School of Constructed Environments, New York, NY. 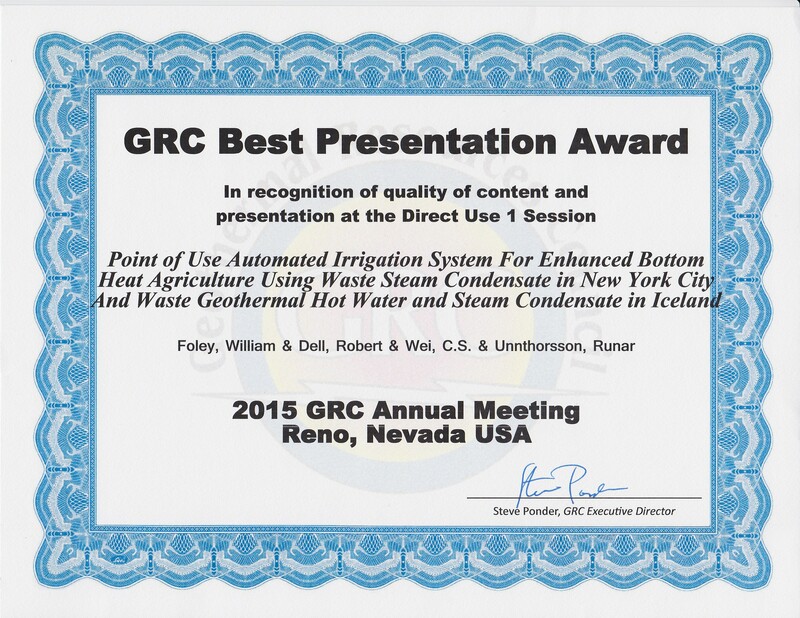 October 2015 -- William Folley (Research Associate) and Prof. Dell win the Geothermal Research Council's Best Presentation award for their work on Heated Garden Research. September 2015 -- Cooper Union IGEM team advised by Prof. Medvedik receives gold medal placement at IGEM 2015! August 2015 -- Prof. Cataldo discusses green roof research on NY1. July 2015 -- Bioengineering SURF 2015 launched - our first 10 week Research Experiences for Undergraduates program is in progress. See web article here. April 2015 -- Prof. Yecko receives NSF grant: "Collaborative Research: Improved Vehicle Autonomy in Geophysical Flows"
April 2015 -- Prof. Lepek has been awarded the prestigious Fulbright Scholar grant to lecture and do research at Graz University of Technology in Austria during the 2015-2016 academic year. April 2015 -- Prof. Lepek is the recipient of the American Society for Engineering Education 2015 Ray W. Fahien Award for outstanding teaching effectiveness and educational scholarship. April 2015 -- Prof. Sidebotham authors "Heat Transfer Modeling: An Inductive Approach", a textbook published by Springer. March 2015 -- Prof. Wolf's classic paper in Chaos Theory continues to be widely cited - 6000+ citations and counting! Wolf, A., Swift, J. B., Swinney, H. L., & Vastano, J. A. (1985). Determining Lyapunov exponents from a time series. Physica D: Nonlinear Phenomena, 16(3), 285-317. March 2015 -- Professor del Cerro Santamaría is the Guest Editor and co-author of the Special Issue on Technological Futures, recently published (March 2015) in the International Journal Technology in Society. February 2015 -- Prof. Raja co-authors a paper accepted to AAAI-15, a tier 1 conference in Computer Science. Fast Convention in Dynamic Networks using Topological Knowledge, Mohammad Hasan, Anita Raja and Ana Bazzan. February 2015 -- Prof. Raja receives NPS grant to investigate "Modeling Uncertainty and its Implications in Complex Interdependent Networks". January 2015 -- Prof. Mintchev co-authors a journal paper on feedforward chains: Lanford III, O.E. and Mintchev, S.M. Stability of a family of traveling wave solutions in a feedforward chain of phase oscillators. Nonlinearity 28: 237-261, 2015. January 2015 -- Prof. Dell is a Technical Consultant for the United States Department of Energy for the SBIR/STTR Phase 0 Assistance Program. January 2015 -- Prof. Raja gives a talk about "Coordinating Actions Across Agent Boundaries" at IIT Chennai, Department of Computer Science and Engineering. November 2014 -- Prof. Savizky speaks about “Characterization of the binding medium used in Roman encaustic paintings on wall and wood”, 55th Eastern Analytical Symposium, Somerset, NJ. November 2014 -- Prof. Dell receives Outstanding Presentation Award from the Geothermal Resources Council annual meeting’s session on Direct Use/Heat Pump session for paper on heated ground agriculture research and development in Iceland. September 2014: Profs. Robert Dell, Stan Wei and George Sidebotham were awarded United States patent US 8,829,326 B2. The Thermoelectric power generation device is owned by the Cooper Union. August 2014 -- Prof. del Cerro Santamaría was designated Visiting Scholar in the Graduate School of Architecture and Planning at Columbia University (2014-15), where he undertakes research on Urban Megaprojects and Sustainability. November 2013 -- The “Robert Dell papers”, a research holding of the Smithsonian Archives of American Art was established for Prof. Dell's contributions as a "major American artist.." and a "progenitor of sustainable art" . 2010 -- Prof. Tzavelis leads Cooper student group to AISC Steel Bridge competition. May 2016 -- Robot Sumo Event, the mechantronics' final project exhibition, featured in Scientific American, Vice and Ars Technica. March 2016 -- ME Senior Amy Chambers featured in ASME Newsletter article. May 2013 -- Prof. Lay’s work featured on Phys.org, "Metallic-to-semiconducting nanotube conversion greatly improves transistor performance"